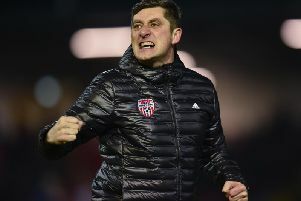 Derry City beat old rivals Finn Harps, to secure their first away win of the season. The action packed five goal encounter at Ballybofey sparked into life on 37 minutes, as Harps were rightfully reduced to ten men when Colm Deasy was shown a straight red card, for a horrific challenge on ex-Harps man Ciaran Coll. Derry broke the deadlock in the second half as Aidy Delap scored his first goal of season blasting home from close range on 53 minutes. To their credit the ten men drew level on 75 minutes as Nathan Boyle scored against his old club, however things turned quickly back into City's favour thanks to young striker David Parkhouse. The front man gave Derry the lead again on 83 minutes when he powerfully headed home Jamie McDonagh's fantastic right wing cross. Then in stoppage time a goalkeeping howler by Ciaran Gallagher allowed Parkhouse to sneak in and score. 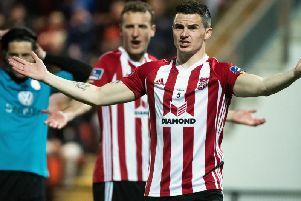 Derry City's David Parkhouse netted a second half brace at Finn Harps. The goalscoring wasn't over as Harps scored from the penalty spot on 95 minutes when substitute Mikey Place side footed home from the spot, after Ally Gilchrist was aadjudged to have fouled Keith Cowan inside the box.